I have not been quilting much in the last few months, but this past week, I have been busy in the sewing room, making small items for two upcoming auctions. The first auction is for one of my kids's hockey team. The attendees will be mostly moms and dads who spend a lot of time at the rink so my first few items are polar fleece scarves in our team colours. The first two turned out all right, but I realized that the yellow wasn't quite right, so I made two more. Then I made a 20 x 20 fleece pillow - again in team colours. It's hard to take good pictures of pillows, but trust me, it's niiiiice! I think it's going to be a hit! Keeping with the hockey theme, I made a couple flannel pillowcases. Stocking stuffers for the hockey player, anyone? And finally, a small "first aid" pouch which I will partially fill with band aids, gauze, medical tape, and suggestions on what else to include in the kit. Fingers crossed that these items bring in more than the cost of materials! I did mention another upcoming auction. Fort that one, I have one small project done, and at least one more to go. More on that later! By now you all know I like to make personalized pillows for my kids' friends' birthdays. But what do you give for a repeat birthday? These two little recipients have already received pillows one year, and recycled cotton skirts the next. This year, I had to come up with something different. Some strange combinations for Miss O, but 100% approved by a 6-yr old! It's like a reminder from my daughter: Don`t be afraid of colours! These were a lot of fun to make. There are tons of tutorials out there, and I don't remember which one I followed the first time, so I am not going to share one but one thing I am going to share is the dimensions I used so that the scarves are better suited to little girls. I used various strips that were 12" wide to make a piece of approx. 12" x 48"-50" which was then folded and assembled. My daughter tried it on and it was perfect. Since we are on the topic of infinity scarves, here is one I forgot to share, made by my friend's 10-year old. (In case she reads this, yes, I know she is 11 now, but she was 10 when she made it). The first time Miss Z came over to our house and saw my sewing room, she showed a lot if interest for all the pretty fabrics. She had definite tastes so I told her to set aside some that she liked. The next time her family was over, I took her to the sewing room and showed her how to make an infinity scarf. She did it all herself, except for a little hand sewing at the end which I know she could have done by herself, but we ran out of time. Sewing with kids takes patience, but is always rewarding. I am looking forward to more sewing with Miss Z. And speaking of things to look forward two, I am also looking forward to making more infinity scarves, and maybe getting some more colour advice from my daughter! Baby quilts are fun to make. They are small, quick to make, portable... I have made a few baby quilts over the last couple of years, but there has been a baby shortage in my circle. Close friends and cousins are all past that baby age, and the next generation is nowhere close to having babies, so baby quilts have been accumulating. And then, all of a sudden, everyone is having babies! a colleague, a kids' teacher, a former babysitter and her sister all had babies or are expecting. Time to send some of the quilts to good homes where they will be loved! My colleague J and her husband L are expecting their first child. It's a girl! J is well known for her sense of style, so I figured I'd better ask which one she wanted. After consultation with her hubby, she chose one of my personal favourite: my rendition of Up, Up and Away, by Amanda Jean Nyberg. Next, one of my kids' teacher is expecting a girl this summer. I wondered whether a baby quilt was appropriate. Should I be giving a "baby" gift when it is her work as a teacher I want to acknowledge? I decided that she would probably appreciate the quilt more than the baby would, so the gift is really for her. Plus, it is kind of fitting: She took time all year to polish my "diamond in the rough" and guide him towards becoming a more mature pre-teen, and in turn, I am wrapping her little one in hand made love. Next is my former babysitter, B, who just had a baby boy a couple weeks ago. I haven't see the baby yet, but little S is getting this blue-green quilt. I love simple squares patchwork! Finally, that former babysitter has a sister, A, who also had a baby boy just a few weeks before. I don't know her very well, but I am just too happy to have an occasion to give another handmade gift! Plus, I really, really want to see the baby next time she comes to visit her parents! Despite having a big pile o' quilts, I decided to make her a little something - my classic "quick" blanket. It's 1 meter (or yard) of flannel + 1 meter of cotton, put together envelope-style, then quilted. My stash is lacking in the boy or gender-neutral department, but I "happened" to be at the fabric store when I stumbled upon these little monkeys (in flannel). Had to have them! I found a cute polka dot cotton to complement it and there you have it! I love the texture and versatility of these soft snuggly blankets (I hesitate to call them quilt, though they are technically quilts). Each of my own kids had one, they went from the stroller to the playpen to the car, to the park and at the beach, and everywhere in between, well into their toddler years. So happy to be a quilter and being able to welcome little ones into the world with something soft, warm, made with love! My daughter had a birthday party to go to this afternoon, so of course, I had to make a personalized pillow. I'm kind of a last minute gal so when I got up this morning, it was time to spring into action. I went for a walk with my daughter and we talked about the pillow. She wanted pink and blue and once she saw some tulips, the pillow had to have tulips as well. She chose the fabrics and the thread colour and drew the tulips on freezer paper for me to iron on fabric and cut. I would have liked to get her to do some of the sewing, but I was running out of time. Nevertheless, it was a true collaboration. This said, I don't think the 7 year old recipient will mind. Like most quilters, the members of my guild, Maritime Modern Quilt Guild, love giving. At our last meeting, 11 quilts were donated to the Lodge That Gives, a home away from home for patients receiving cancer treatments at the local hospital. I can't take any of the credit for this, as I did not participate. This year, thought, I am stepping up and participating in our new charity activities. We have taken on two charity projects. I love that when it came time to vote, the members did not want to choose one suggestion over the other, but decided to embrace both projects that were presented. We'll be making quilts for the children's hospital, something I'll talk about in another post, and we'll also be making 87 pillows to brighten up resident's rooms in a local nursing home, an initiative of my guild mate Jeanette. I have made five pillows so far and I know many of my guild mates have also started, making one or two or, in some cases, many more. There is a nice mix of modern and traditional, bright and subdued, something for every taste! Most of mine are made from my older, neglected stash, using more traditional patterns. I figured that, while most people would enjoy all the modern pillows, some folks might prefer traditional styles. Of course, I couldn't help using this awesome (sort of) fish fabric that made its way into my stash many moons ago... There's got to be at least one resident who is going to enjoy it! Making pillows is such a great way to use fabric, and try different blocks and quilting motifs. I've really enjoyed making those and I hope that they will be enjoyed by the recipients. What charity project(s) are you participating in ? 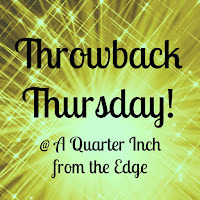 Linking up to TGIFF which is coincidentally hosted by another one of my fabulous guildmates, Anja, who blogs at Anja Quilts. Also linking up to Finish it up Friday at Crazy Mom Quilts. Here we are for another Throwback Thursday. This quilt was made in 2008 for my mom. 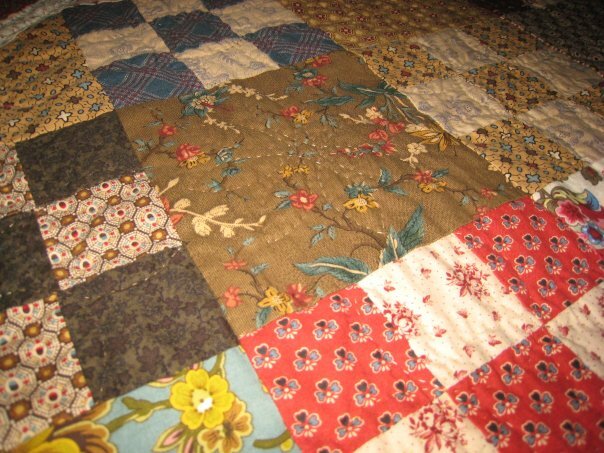 It is a lap quilt made with mostly civil war reproduction fabrics, the odd shirting, and a coupe larger florals. Although this wasn't a scrap quilt (I did not have a stash at that point) I included a couple of odd blocks with mismatched fabrics to add a bit of interest. You can see an example of this in the blue/beige nine patch block in the center of the photo where one of the four side squares is solid blue. That was quite the wind, but the quilt did not fly off. In case you are wondering, the super duper clothespins are from Lee Valley . You're welcome ;). Even though I am making more modern quilts these days do have a soft spot for all things vintage including 1930s and civil war reproductions. 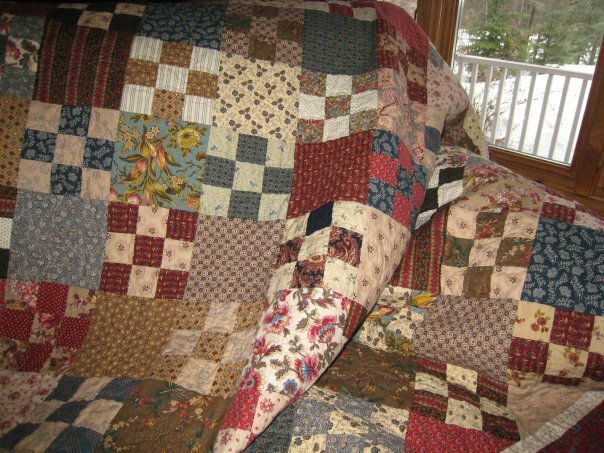 I still love this quilt as much as I did when I made it, and my mom does too! Linking up with Jenn at A Quarter Inch from the Edge, and off to see other people's oldies! It's another finish, and one I am so excited about! You can scroll down for the finished pictures, or read all about the making of. Spring/Summer 2013 - having been quilter for many years, it dawned on my that our bed was the only bed in the house that did not have a quilt on it. Sounds familiar? So I set out to make a simple quilt made of 3"x 9" strips, using some favourite fat quarters I had been accumulating. The top went together quickly and it sat for a few months until I took it to the cottage with me and thought it would be a great idea to have a little clothesline photo shoot. Big mistake. The pictures are pretty, but the quilt top frayed and had to be repaired. I could not get myself to do it, so I set it aside until the following winter. Lesson learned: Do not hang an unfinished top on the clothesline on a windy day. January 2014, I got a fantastic idea for the quilt back. My long time readers may remember this word scramble: B D E G G H I I N N N N O O O T T U.
I was pretty pleased with my efforts, but the quilt sat for another two years. December 2015 - with the encouragement of my visiting mom, I replaced the frayed pieces. She convinced me it wouldn't take long, and of course she was right! Then I showed her my "bonne nuit good night" section for the back, and the first thing she says was: "why would you want to hide that on the back?" And of course, mom was right again! Just a matter of ripping one row and adding a row with the message, right? Wrong! The message almost took the whole width of the quilt - which was fine when it was hidden in the back, but would not look good on the quilt top as it was wider than the bed itself, and the beginning and the end would be falling on each side of the bed, so that you would only see "ne nuit good ni". Not cool. Some letters could be narrowed easily, other had to be redone, spacing had to be adjusted... with little spare fabric to play with (most of them used to be fat quarters and were all used in the quilt). I also switched the English and French sides of the message, to correspond to the English and French sides of the bed. Oh! What work, but well worth it. I plowed through, sewed the top back together, produced a backing and sandwiched and quilted it, the largest quilt I've ever quilted (96" x 97"). ...and tiny loops in the beige background to make the message pop out. The binding was again another challenge. I wanted a single fabric - not scrappy - and something that was already in the quilt. Linda came to the rescue with a piece of that Amy Butler green/pink floral which, combined with my own leftovers was just enough to make 386" of binding. Thanks Linda! I've said many times that I truly enjoy hand sewing the binding, and it's one of the things I usually save for working on the plane when I travel, so I had fully anticipated working on this quilt on my recent trip to Toronto. Until I realized a 97" x 96" is so huge, I need a big duffle bag to carry it! So this quilt did not travel to Toronto. It went to waiting rooms, swimming lessons, a guild meeting, a family dinners, gymnastic class, and even a car ride. It's been finished for over a week but I had to wait for a sunny day for proper pictures. On that note, Bonne Nuit / Good Night to you! Linking up to TGIFF hosted by Laura at Quokka Quilts and Finish it up Friday at Amanda Jean's Crazy Mom Quilts. Hop over to see what others have finished! When the working day is done and the kids are tucked in, I do one of two things: put on my running shoes and go for a run, or go to my sewing room where I turn bits of fabrics into quilts. And now, I blog about both.